Mark: Hi, it’s Mark from Top Local. We're here with Bernie Pawlik, Pawlik Automotive in Vancouver, for the Pawlik Automotive Podcast. We're talking cars. A 2000 Mercedes this morning. How you doing, Bernie? Mark: This is an SLK230 convertible. It had a convertible roof problem. What was going on with this vehicle? Bernie: The owner of the vehicle went to put his roof down, or moved it up. I'm not certain which of the two. But the roof stopped working part way through the process. That was the issue. It had basically jammed up and wouldn't open or close. Mark: What do you do when the roof gets stuck part way open? Bernie: This is a good time to have your owner's manual of your vehicle in the car, because it's a kind of thing where you probably never pre-study it. It's one of those things where you need to go, "Oh, what do I do now?". There is in the owner's manual a procedure, and almost all convertible vehicles have a procedure to close the roof when it jams up. It's a little complex, but once, I actually had to do it a few times myself while in the process of repairing it. It's actually fairly simple once you get the procedure figured out. They think of all the things you need to do to make sure you can close the roof, even if the trunk's fully closed. There are levers you can pull and things that'll actuate things to allow you to actually manually just lift the roof closed and latch it in place. Key, you have a convertible, make sure you have the owner's manual in the glove box or somewhere accessible so you can actually do this. What I'll do is actually, I've got a nice video here of the actual roof in operation so you can just kind of have a look at that really quickly. Alright, let's start. There's the roof on. The windows go down. The trunk opens. The roof folds in, all pretty quick. This little piece comes up, goes back down. The trunk closes and hides the roof, and the windows go back up. That's all. You just hold a switch and then it does its whole operation. Pretty amazing. Now when the roof, in our diagnostic procedure what I found was, the roof, I'm just going to backtrack the video here. When I was opening the roof, it would actually get to about this point here and then jammed up, and it would stop working. Mark: You suddenly have a big air dam on the back of your car. Bernie: Yeah, and it's un-drivable. At that point you really have to figure out what's going wrong, and fix it. Mark: How did you go about diagnosing what looks like a pretty complex mechanism and set of actions? Bernie: Critical to diagnose in these vehicles is a good quality scan tool that will read all the data and information in the vehicle computer. Plugged it in. Found a trouble code stored for a latch switch, so I figured that's a good place to start. The latch of course is at the front of the convertible top where there's to actuators that lock the top. There was a fault with the switch. With these tops, there's a number of switches for different things. Obviously they want to know when the trunk's open, because everything has to follow a certain sequence. What was happening is, as the top was opening, all of a sudden it would get a signal that the latch switch was closed and it would shut the whole system down. From that at least we knew an area where the issue was occurring. It was a latch switch failure. Then the next issue was to figure out, "Okay, what? The switch is bad? Is there a wire? ", what was causing the next phase of the issue? Mark: Once you found that, where the fault probably was laying, then what did you do next? Bernie: The next step was to remove the liner of the top, which, fortunately this car it's actually not too difficult to access things. Removed the top liner. Found and tested the switches. They were both working fine. Pulled the side covers off, and then I started manually operating the top. But I noticed that when it got to that point, what I showed on the video just a few minutes ago, when it got to that point all of a sudden you could see on the computer, because it'll tell you when the switches are actuated, it would tell you that the latch switch was closed. If I moved it up a bit, it would say it was open. Right away I knew, "Okay. There's got to be a wire that's broken or shorted or something there that's telling the computer that the latch switches are closed". They're pretty simple. They're a switch that grounds a wire. I figured, with all that movement over the years, a wire is probably pinched or something's happened. Next step was to remove the wire. 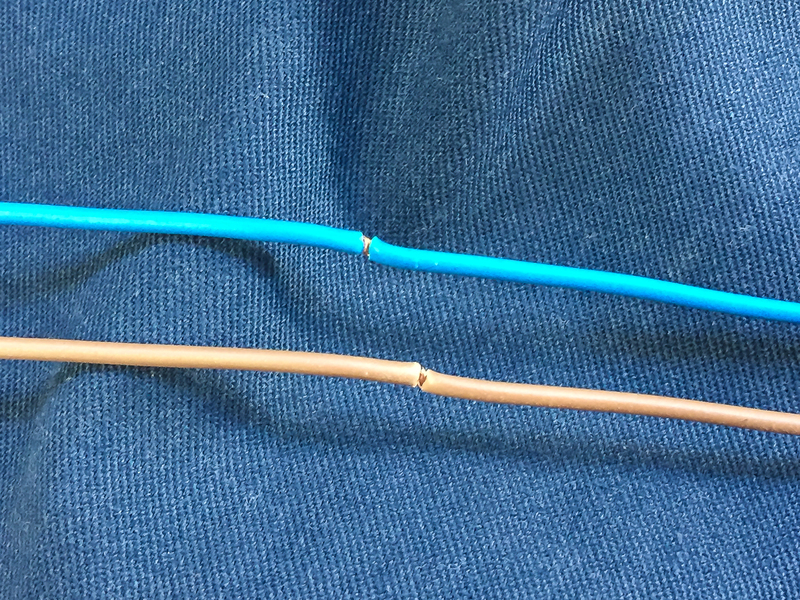 There's a nice plastic cover over the wire, so we removed the cover off the wire, and then I found the issue. We'll go back to screen sharing, because it's always nice to look at some pictures here of things. There by the way is the car, which we've already seen. Mark: Pretty nice for an 18 year old vehicle. Bernie: Oh, it's beautiful. In really nice shape. It's a gorgeous little fun small little convertible. With the hard top roof too. If you drive it in the rain, it's just the same as having a hard roof car. You don't have that compromise of a convertible with a noisy top. There's the problem we found. About halfway down the wiring harness, and these wires run, I should just show the picture. Go back to the car again. These wires run sort of along here, down the back, on the passenger side, and then into the trunk where the computer and all the mechanisms are. Halfway down there this is what I found. Two wires. They sit side by side. The insulation is cracked, as you can see. What would happen is, as the roof went down it would pinch the wires together and cause these two wires to short circuit. That's what the whole problem was. Mark: How did you repair the wires? Bernie: The wires themselves were actually in really good shape. I just put heat shrink tubing over top of the wiring insulation to cover them, and then extended the wires a little bit at the top end. I had to actually cut the wires out up at the top near where the latches were. Extended the wires about three or four inches, so the wires would now bend in a different spot, and also positioned the wires such that they weren't side by side in the same positions that they used to be. It kind of created different bending. But I carefully inspected the wire. The actual wire itself is really, it's a really high end wire. It's an extremely fine stranded wire. You can bend it and twist it all day long and the wire copper won't break. It's interesting, because a lot of the wire we buy in the automotive industry, at least at our normal automotive suppliers, is much thicker strand wire. If we'd replaced it with that wire, you'd be lucky to get six months out of it before it just snapped, because the strands are about, for every one strand of this wire there's probably 30 strands of this other wire. It's very good quality wire, but the insulation wasn't quite up to snuff for the long run. Mark: Everything worked like new once you were all done? Bernie: Yeah. It was awesome. These are, our podcasts are like Hollywood movies. They're all happy endings. It worked really well in the end. I was happy to find it too. There's a lot on these tops that can be really really expensive to repair. It's not just Mercedes. A lot of other vehicles use hard top convertibles. The parts are, they're all dealer parts. They're all really expensive. Just finding wiring, it's very time consuming, but at least there's nothing in the way of expensive parts. Mark: Is that a common problem with the more complex hard top convertible tops? Bernie: For the most part they're really reliable. But some of the things we've seen, and this is not just Mercedes. Here there's a wiring issue. We've had Mercedes before where they have an actuator switch that's broken. That'll cause a problem. We've had other vehicles where, there's linkage rods and arms that connect things, and they'll stretch or break. That'll cause problems too. For the most part they're reliable, but there are a lot of moving parts and pieces that can go wrong. I will say on this particular vehicle too, that there were a couple of mechanical things we found that were broken as well. There's a little flap that goes in the back behind the seat. There was, it's a cast piece of aluminum. Actually part of it was broken, and another arm that holds a flap, that piece was broken too. We're still trying to locate some parts. But it doesn't actually affect the movement of the top, but at some point it will break off and jam something up. But other than that, these things are quite reliable and very reparable. We're happy to do them. Mark: There you go. If you're looking for proactive and in depth repairs on your Mercedes convertible tops, or any convertible top actually, in Vancouver, the guys to see are Pawlik Automotive. You can reach them at 604-327-7112 to book your appointment. Book ahead, they're busy. Or check out their website, pawlikautomotive.com. YouTube channel, Pawlik Auto Repair. There's hundreds of videos on there over the last five years. As well, our podcast. Thanks, Bernie.